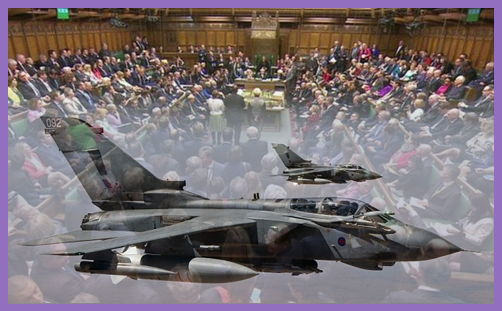 As I began writing this within an hour of the Commons vote, 4 RAF Tornadoes were already on their way to bomb Syria. This is it; the UK is now fully embroiled in the multilateral effort to strike Islamic State/ISIL/Daesh at its very heart. Our MPs have had their say and the final majority was overwhelming. There is no turning back from here. The House of Commons becomes most alive when the boundaries of party politics are blurred and for once MPs are given the freedom to speak from their hearts. Reputations can be made and lost and as is so often the case in these situations it is not the party leaders’ speeches that have the greatest impact. Instead it is those lower down the pecking order who make their mark with speeches filled with passion and honesty. Hilary Benn, who for 16 years has been known for little more than being the son of Tony, is now being talked of as the favourite to succeed Jeremy Corbyn. This drama and theatre of Parliament’s epic 11 hour session across both of the houses demonstrated politics at its very best. We can only be thankful that in the face of a threat unlike anything we have faced in our lifetime, MPs and Lords, irrespective of their point of view, repeatedly placed justice and principle above revenge and hatred. Where ISIL show an utter disregard for the life of others, our parliamentarians have fought over the best ways to preserve and protect the life of all those affected by the chaos and death radiating out from Syria and its surrounding countries. It was a painful vote precisely because we cherish life and freedom so dearly and no solution offers an escape from the inevitable deaths of innocents. The Prime Minister’s strategy.. rightly recognised that military action is only one part of the answer. But there must be a global theological and ideological component – not just one in this country – to what we are doing, and it must be one that is relentlessly pursued and promoted. And it must include challenging Saudi Arabia and Qatar, whose own promotion of a particular brand of Islamic theology has provided a source from which ISIL have drawn a false legitimisation. It must also show clear support for global mainstream Muslim and other religious leaders.. Without a far more comprehensive approach we confirm [ISIL’s] dreadful belief that what they are doing is the will of God. Ultimately this is not a physical war, but a spiritual and ideological one. It can only be won if we acknowledge that this is a battle for supremacy between the followers of competing cultural and religious gods. ISIL ‘s ingrained belief is that they hold the keys to Islam. By establishing a caliphate they have announced to the world that theirs is the true form of Islam to which all Muslims and non-Muslims must submit or face death. We in the West have our god of liberal secularism that drives much of our thinking and our actions. Despite what some may think, it is derived from the vast depths of Christian morality and whereas that two can in theory exist comfortably side by side, this form of Islam provides a dangerous and uncompromising challenge that deliberately aims to eradicate those other gods. Victory for any side lies not in military power but something less tangible: the power of hope. As long as hope remains any defeat is temporary and it is in truth that lasting hope is to be found. We have chosen to fight ISIL because we hope for a restoration of peace and that our values will bring greater freedom, prosperity and security than their extremist interpretation of Islam offers. We also hold on to the very Christian hope that good will ultimately conquer evil. Logically there is no such guarantee, but intrinsically we sense that those who propagate evil cannot do so indefinitely. For Christians it is at the core of their faith. God, through the death and resurrection of His son, brings salvation to the world. Without that hope everything is lost. It is fundamentally down to this belief that we see ourselves as custodians of what is right true and proper. It is so rooted in our cultural DNA that when we see grave injustice in the world, especially when it threatens our way of life, we cannot resist the urge to act.